Detail of the monument to William Worth in New York City’s Worth Square. I was up in New York City the other day, and the visit made me wonder if the entire world has invisible connections to George Meade, if only you know where to find them. While my wife visited foodie heaven of the Eataly in the Flatiron District, I wandered around the neighborhood where, much to my surprise, I discovered the granite obelisk that rises above the gravesite of Major General William Worth at the aptly named Worth Square. The tall column bore the names of the various battles in which Worth fought, starting with the War of 1812’s battles of Lundy’s Lane and Chippawa. It also included the names of several battles from the Mexican-American War, including Monterrey. 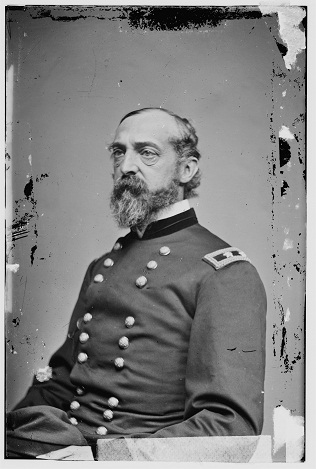 That’s why I knew Worth’s name—because George Meade fought with Worth during the Mexican-American War. Like Meade, Worth served with Zachary Taylor’s army. During the long buildup to war Worth became involved in a testy fight over the status of his brevet rank. A brevet rank is purely honorary, the equivalent of the government’s pat on the back for a job well done. Meade once described a brevet as a “fictitious rank.” A colonel who gets a brevet promotion to general is technically still a colonel. 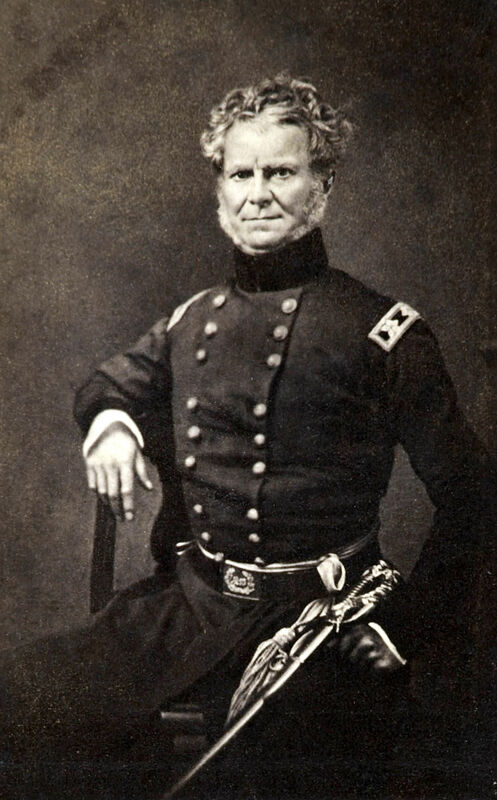 Colonel Worth received the brevet rank of brigadier general for his service in the Seminole War in Florida. Colonel David Twiggs did not have a brevet rank but his rank as colonel predated Worth’s. Worth insisted his brevet made him senior to Twiggs. 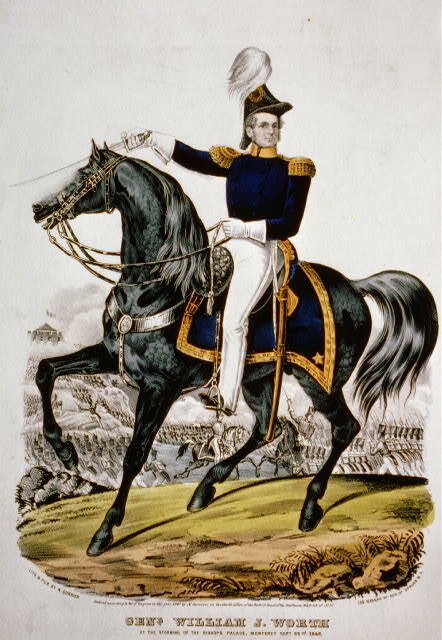 “The question then arose who would command in case of the death of General Taylor, and after much discussion and excitement, numerous petitions were sent to the President and Congress, and finally the President made a decision adverse to the brevet,” Meade explained in a letter to his wife. Worth resigned from the army in a huff and set off on the long trip back to Washington to complain. In fact, Meade was back with Worth’s command during the fighting for Monterrey. Unlike Meade, who got sent home, Worth fought all the way to Mexico City. (He then fought with General Winfield Scott, with the two generals, once fast friends, filing charges and countercharges against each other.) Worth died in San Antonio in 1849 while commanding the army’s Department of Texas. His body was reinterred in New York City in 1857. The historical marker on the cast-iron fence informed me this is the city’s second oldest monument (the oldest being the George Washington at Union Square). It is also one of only two monuments in the city that are also mausoleums, the other one being Ulysses S. Grant’s tomb. Meade, of course, served with both men. 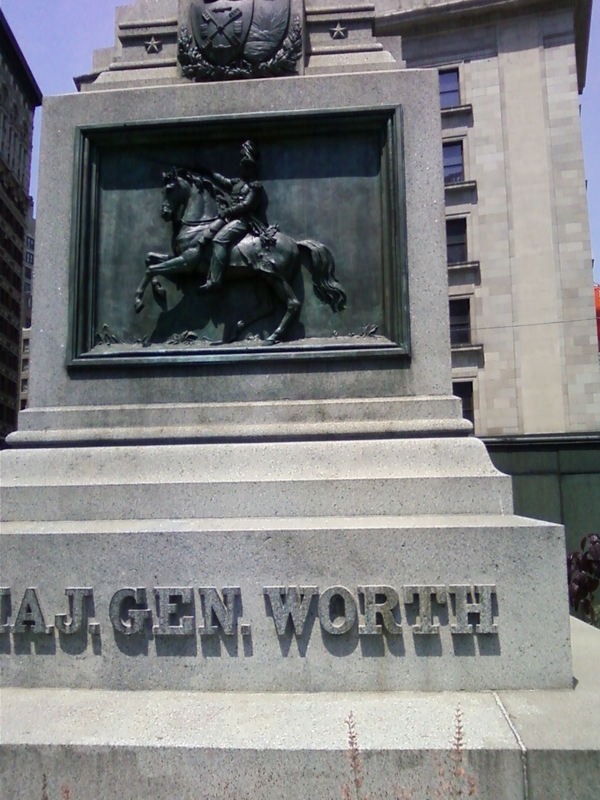 When I rounded the corner in New York City and came face-to-face with this memorial to General Worth, I felt like I had suddenly bumped into an old acquaintance. I took out my camera phone and was snapping some photos when a white-bearded man, his face red from the sun and a large camera bag hanging from his shoulder, approached me. “So you’re interested in General Worth, are you?” he asked. I told him I was actually more interested in George Meade and explained that Meade had known Worth during the Mexican War. We then had a nice chat about Worth and war and cannons and all sorts of things. Turns out my new friend was working on a history of the army’s Fort Slocum in New Rochelle, New York. “Ah! Named after one of Meade’s corps commanders!” I said. “It’s all gone now,” he told me. Still, we agreed that history is all around us—you just need to know where to look. And when you find it, don’t be surprised if you also discover a connection to George Gordon Meade. Like many people, I found Michael Shaara’s novel The Killer Angels to be pretty captivating. I read this fictionalized account of Gettysburg a long time ago but I still remember the strong sense of relief I felt as Shaara described Major General John Reynolds and the I Corps reaching the battlefield on July 1 to relieve John Buford’s beleaguered cavalry. And I remember the sense of shock that followed when (spoiler alert) Reynolds fell dead with a Confederate bullet to the back of his head. Reynolds played a big role in George Meade’s Civil War career as they rose together in the Army of the Potomac. 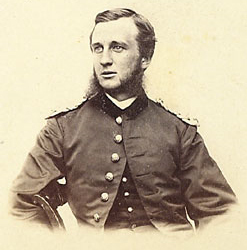 Reynolds was Meade’s commanding officer for a time, positions that were reversed for a very brief period starting on June 28, 1863, when Meade took command of the Army of the Potomac. Three days later Reynolds was dead. I was asked by two officers, General Russell being one, whether General Benham was not drunk. I said he was not, as I knew he took wine only and not any liquors. Then, too, I was accustomed to his swearing, etc., and thought nothing of it. Pretty soon a captain came riding along on horseback, and General Benham opened on him, yelling out in a loud tone of voice and Goddamning him. This, too, right on the bank of the river and when he had just been cautioning every one to keep quiet. I said to the general, “Don’t call out so loud, sir, the enemy can hear you.” He still kept on, however. . . . When I came back about 6 o’clock, I found General B. drunk as could be, with a bloody cut over his left eye, and the blood all over that side of his face and forming a disgusting sight altogether. He had fallen down and cut his face. Soon after he reeled in his saddle, and in trying to shake hands with General Pratt, he fell right off his horse on to the ground. I saw him do this. The soldiers picked him up, and he mounted again, and rode round among the men, swearing and trying to hurry matters, but only creating trouble and making himself the laughing-stock of the crowd. Finally three bridges were got across and then we started for the two lower bridges where an unsuccessful attempt had been made to cross in the morning. The general had got moderately sober by that time, and began to feel slightly ashamed of himself. I never in my life have been so mortified and ashamed as I was this morning. I shall leave his staff as soon as possible, and I don’t see how he can escape a court-martial and dismissal from the service. By sheer good luck we got the men across the river and built the bridges. General Benham’s being drunk delayed the laying of the bridges for four hours; his mismanagement all but ruined the whole plan. Every one there expected a disgraceful termination to the whole affair, and as I have said, good luck only saved us, for the rebels had two or three hours to prepare themselves, after we arrived on the ground, when they should have had but half an hour at the outside. Simply astonishing behavior. Weld followed through on his resolve to leave Benham’s staff and he got an appointment with Reynolds. In fact, as I mention in the book, it was Weld who delivered a message from Reynolds to Meade on July 1. He was on his way back to the battlefield when he met a messenger who told him Reynolds had been shot. He hoped it wasn’t true. A little further on he found undeniable proof that it was when he the encountered the wagon carrying the general’s body. 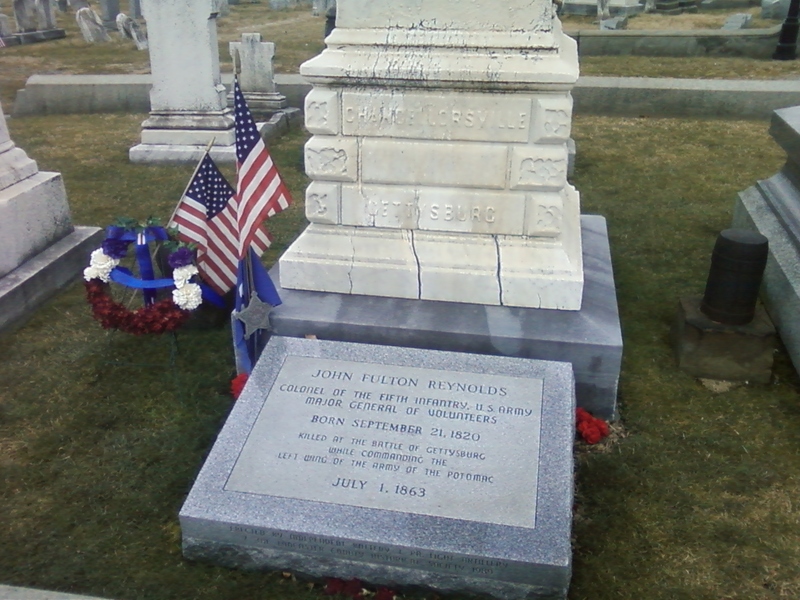 Last winter I visited Reynolds’ grave at Lancaster Cemetery. It was a dreary, gray afternoon and the cemetery was deserted. The few spots of color were the American flags fluttering in the weak winter breeze on veterans’ graves, and a colorful flourish from the bright green holly tree that stands in the Reynolds family plot. The general’s body was beneath a weathered white obelisk, its inscription nearly worn away. (In 1989 the Independent Battery of the First Pennsylvania Light Artillery and the Lancaster County Historical Society placed a more resilient granite stone at its base with a copy of the inscription.) An American flag and a wreath provided two more spots of color. The years have not been kind to Reynolds’ monument. Big cracks marred its base. 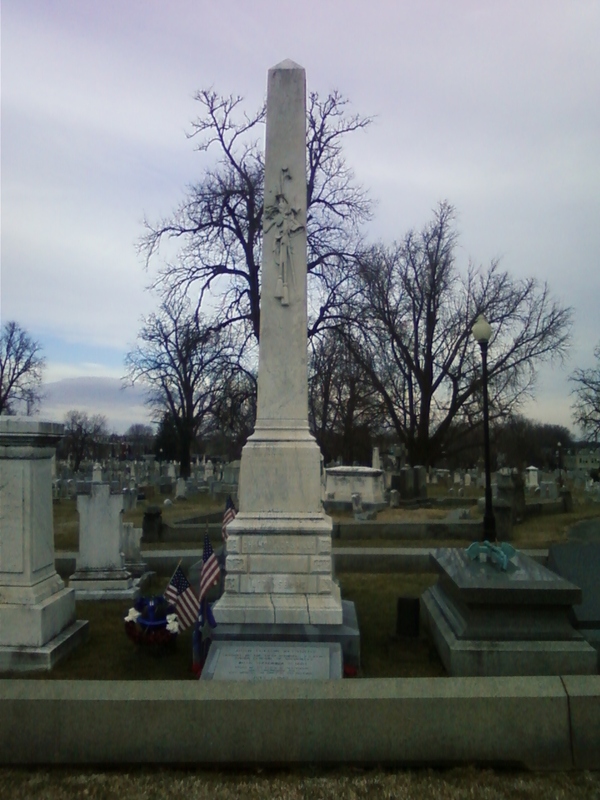 Some of them, in an example of symbolism in real life, extended through the word “Gettysburg.” The trappings of his office—a saber, a sword and a sash, decorated the obelisk’s face, but the elements had worn them smooth, too. Time is an implacable and relentless foe, as deadly as any bullet. While working on a Gettysburg-related project I came across the letters of William Wheeler (right), who was in command of the 13th New York Independent Battery at Gettysburg and had a close encounter with General Meade on the morning of July 3. The young lieutenant was waiting with his guns at Cemetery Hill, he had written, when “an elderly Major General with spectacles, looking a good deal like a Yale Professor” rode up and asked him if he had enough ammunition. Wheeler replied he has as much as he could get without an order from Major Thomas Osborne, the 11th Corps’ artillery chief. With some excitement the general replied, “You must have ammunition; the country can’t wait for Major Osborne or any other man.” He told Wheeler to go to the artillery reserve and have a wagonload of ammunition sent up immediately. Wheeler had just returned from the Artillery Reserve and knew they didn’t have any ammunition to give him but something in the general’s face warned him about answering back. Instead, Wheeler spurred his horse and rode off until he was hidden behind some trees, where he stayed until the general departed. When he returned he found out the “Yale professor” was General Meade himself. Wheeler, William. In Memoriam: Letters of William Wheeler of the Class of 1855, Y.C. Cambridge, H.O. Houghton, privately printed, 1875. Available via Google Books. 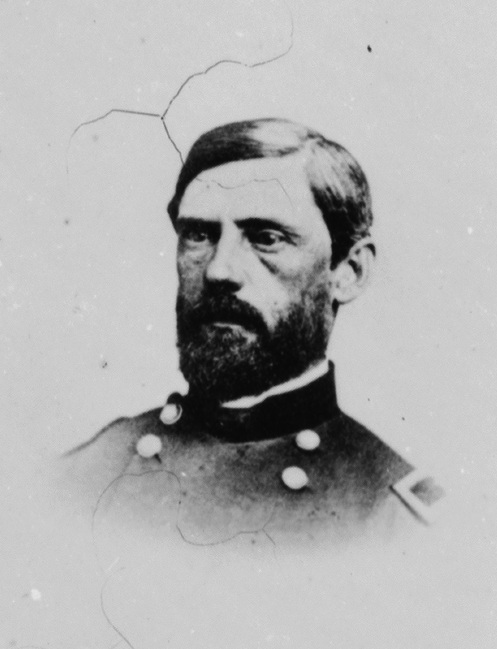 Major General George Gordon Meade (1815-1872). Library of Congress photo. History has pretty much given George Gordon Meade a bum deal. He helped save the Union as the commanding general at Gettysburg, but no one has written a major biography of him in years. Sure, he has a statue atGettysburg, but the memorial to the man he whipped, Confederate General Robert E. Lee, stands atop a pedestal that looks to be twice as high as Meade’s. In fact, history has been pretty good about putting Lee atop pedestals, despite the facts that he fought against a country to which he had sworn loyalty, to sustain a government that considered human slavery as its cornerstone. For many, Lee will always be the greatest general of them all. Except Meade beat Lee at Gettysburg. Meade, it seems, is the Rodney Dangerfield of Civil War generals. He gets no respect. Ulysses S. Grant became president and occupies the $50 bill. Civil War soldiers Hayes, Garfield and McKinley also reached the White House. As for Meade: after the battle of Gettysburg President Abraham Lincoln wrote him a letter to chide him about not immediately counterattacking Lee’s army. Adding insult to injury, later in the war Meade had to testify about his generalship at Gettysburg before a Congressional Committee, mainly because the man who had almost cost him the battle—General Daniel Sickles—was busy spreading rumors that Meade had intended to retreat from the battlefield. In the last year or so of the war Meade also had Grant, now the general-in-chief of the Union armies, looking over his shoulder. And he had to deal with a conspiracy among newspaper reporters, who banded together and agreed not to mention Meade in their dispatches. Meade didn’t get a statute in Washington, D.C., until 1927. 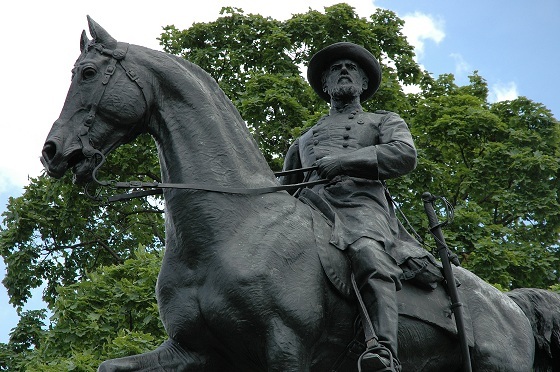 It was one of the last Civil War memorials erected in the nation’s capital, and it got there only after years of bureaucratic wrangling. There just ain’t no justice. In Searching for Meade, I will combine travel and history into an engaging mix that will inform and entertain as I investigate the life and times of George Gordon Meade. Stackpole Books will publish it in February 2013, just in time for the 150th anniversary of Meade’s greatest triumph, the Battle of Gettysburg. On this blog I’ll share a few of the things I learn as we build up to the book’s publication. You can also find a preview of the book in this article from the June 2011 issue of Civil War Times magazine. To find the blog posts from June 2012, go here.